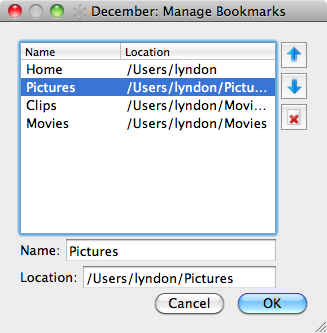 December is a photo browser designed for browsing file systems created by digital cameras. 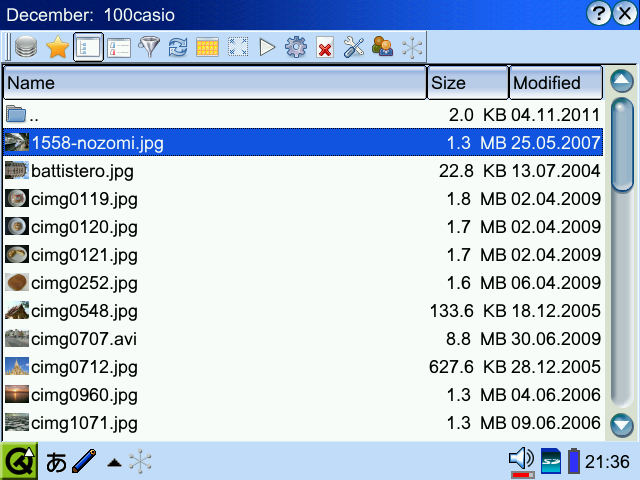 Insert a memory card, run December and it will automatically open the directory containing the photos and make it easy to browse them. 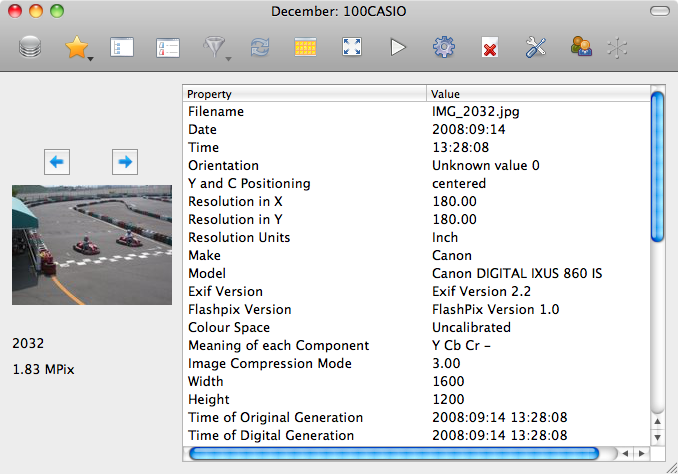 DCF (Design rule for Camera File system) defines how Digital Camera Images (DCIM) are stored on memory cards using EXIF. 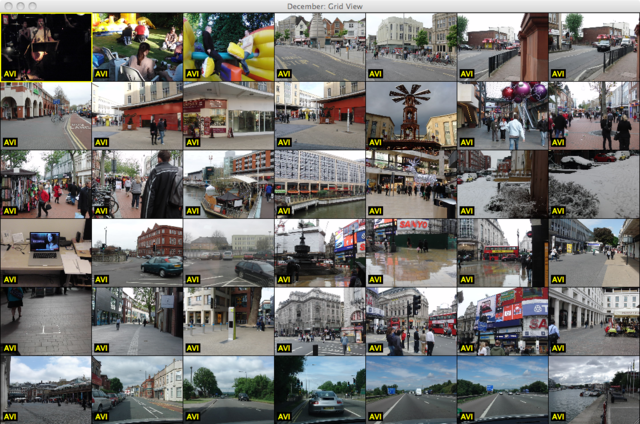 December allows the user to browse the images as if they were using an actual camera and give access to all the details. 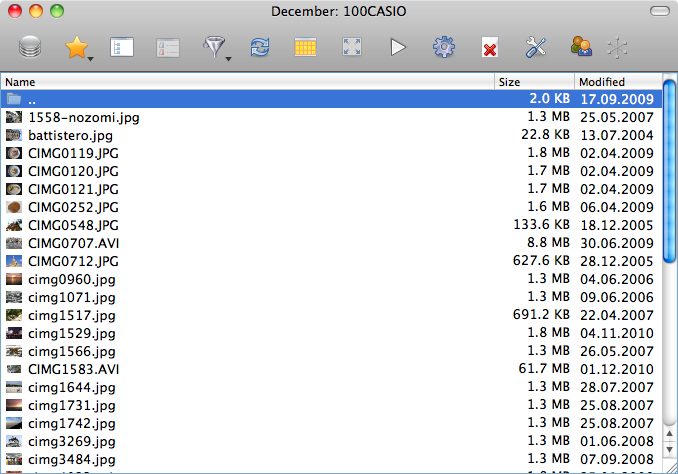 Thumbnails embedded in EXIF mean that it is fast to navigate through the images. 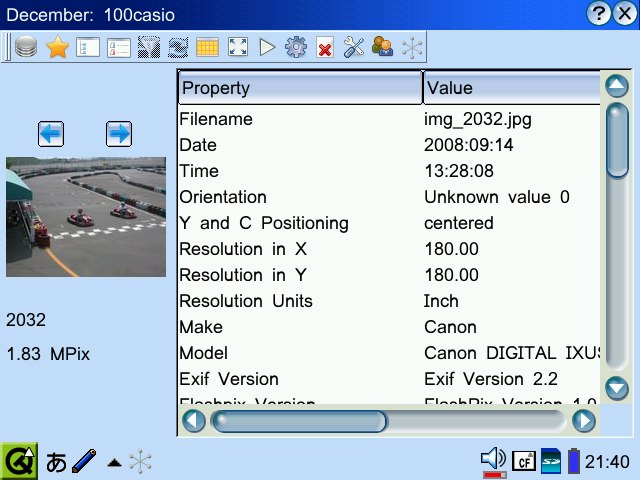 Meta information such as camera, flash and GPS tags can be viewed. 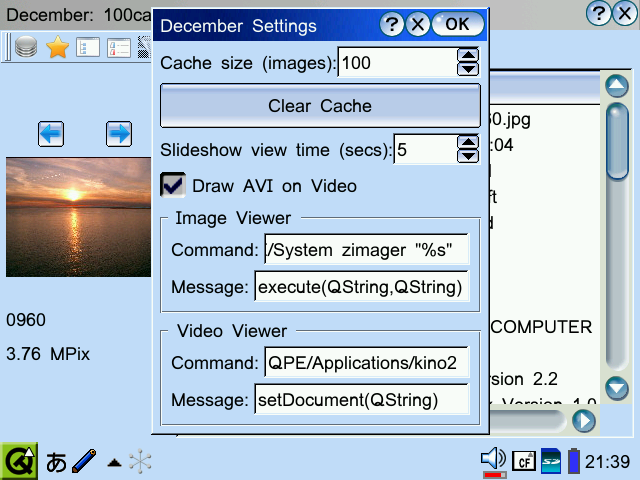 December is available for Zaurus and MacOS X. The Mac version needs to be rebuilt for a modern version of macOS. 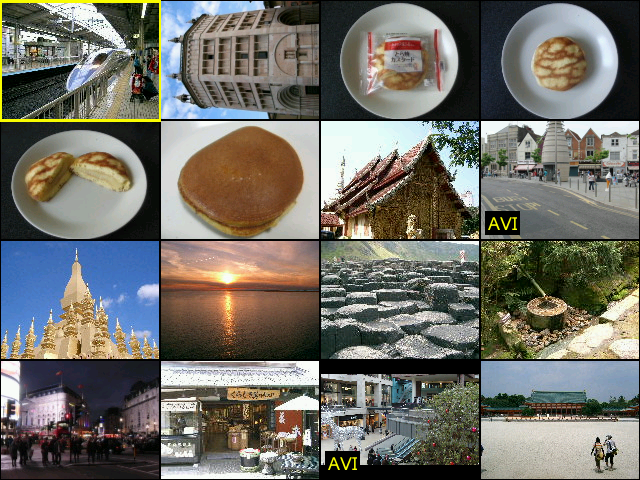 Several changes have been made since the above version was released and development on the next version is not yet complete. Zaurus users need to install libexif from my Zaurus Libraries page if you haven't done so already. 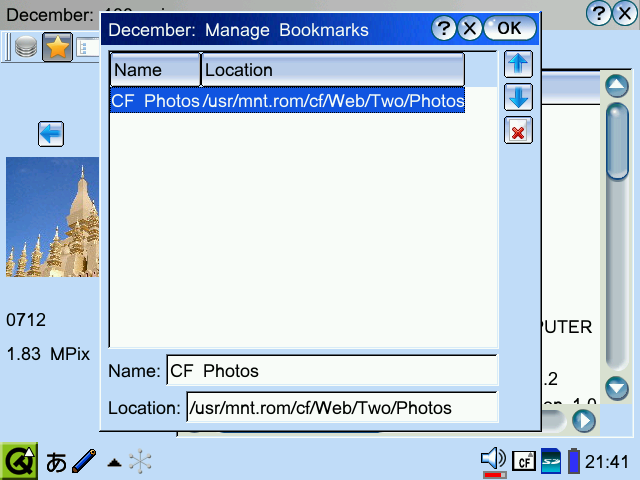 The toolbar icons are from left to right: Goto DCIM filesystem(s), bookmarks, directory view, detail view, grid view, full screen view, external viewer, refresh, delete, settings and about. On Zaurus, use the stylus, cursor keys, jog wheel, OK and Cancel buttons to navigate. 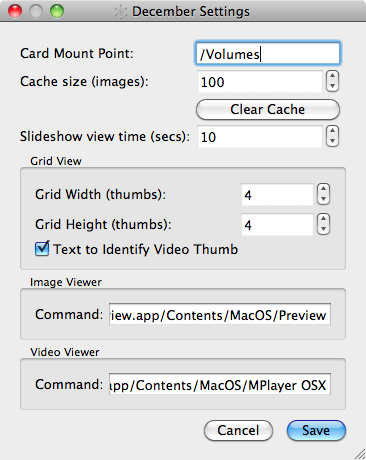 On Mac, use the mouse, cursor keys and Enter to navigate. In the grid view you can switch pages using N and B for Next and Back; you can also use the scroll wheel or gesture to switch pages. Read the detailed help file.